What's New in Stock Rover V4.4? The Portfolio Trade Planning facility is a brand new addition to Stock Rover, making our portfolio management capabilities even better by allowing you to test potential trades. The trades create an alternative version of your portfolio, the model portfolio, which you can then compare against your actual portfolio in a number of key data points. The goal is to assist you in making intelligent changes to your portfolios to achieve your investment objectives by demonstrating how potential trades affect the portfolio across many different factors. In the top left you can change the portfolio you want to model with the drop-down menu, as well as a check box for ‘Highlight changes,’ which will color the rows you’ve changed (green for increasing shares, red for decreasing shares). I like to keep it checked so I can easily spot the changes I’ve made. The left main panel lists the holdings of the selected portfolio, and the right-side panel hosts analytics comparing the actual portfolio against the model portfolio with whatever time period you choose. Let’s take a closer look at the left main panel first. The ‘Price’ column is the current price of the stock, and it is the price used in the calculation for the Model Value. 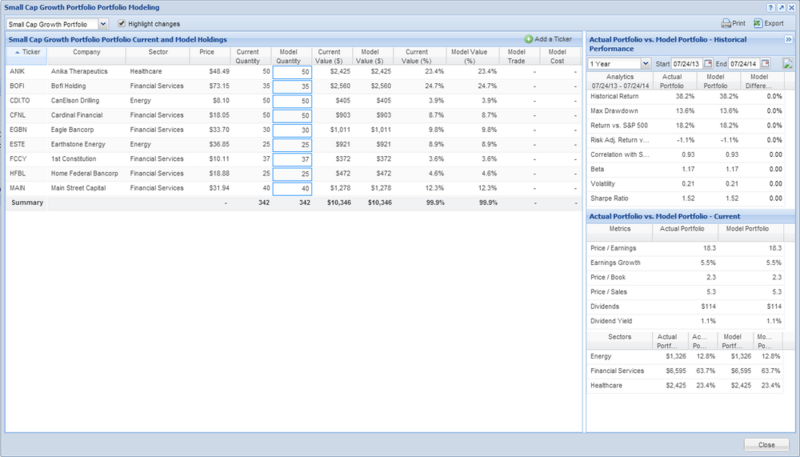 Note that the cash position of the portfolio is not listed in the left main panel of Portfolio trade planning, but instead in the last section in the right side analytics panel. 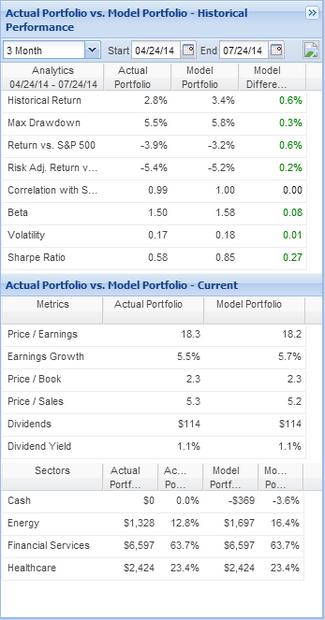 When you make a model trade, it will adjust the cash position of the model portfolio (shown three screenshots down). Like in the main Table of Stock Rover, you can click column headers to sort by any column, drag-and-drop columns into a new order, as well as right-click a column header to group the holdings by sector. You can also pop out the window into a separate window. As you edit a new quantity in the Model Quantity column, the last four columns update to reflect the change, as do the analytics on the right side. For example below I’ve updated my ESTE holdings in my Small Cap Growth portfolio from 25 to 35 shares. I have ‘Highlight changes’ checked, so the row has been colored green because this is a share increase. The Model Value column has updated to reflect the current price multiplied by the value in the Model Quantity cell, and the Percent of Total Value is now 11.3%, instead of 8.2%. The Model Trade column calculates that I acquired ten additional shares, and the Model Cost of that was the current price ($33.52) multiplied by the Model Trade. Now, let’s look at the right-side panel, which compares my actual portfolio to the model one. How would those ten shares of ESTE affect my portfolio’s performance? The first section shows some analytics for the current portfolio and the model portfolio for the selected time period. Historical Return shows the actual return of my portfolio in the time period, and then what my return would’ve been if I’d executed the trades in the model at the beginning of the time period using prices from the beginning of the time period. So, continuing with the above example, if I bought ten more shares of ESTE three months ago (using the prices from three months ago), my overall portfolio return would be 3.4% instead of 2.8%. Below that are some metrics that measure the riskiness of the portfolio in the selected time period. Using data from the past and extrapolating forward, it gives you a sense of how risky the new model portfolio would be. So here I can see that if I made this trade, my portfolio would have a slightly higher beta and volatility, but my returns vs the S&P 500 would increase as well. The second section gives some stats about the model portfolio. Because this wasn’t a huge overhaul of the portfolio, the stats don’t look too different, but I can see that if I added ten shares of ESTE, my Earnings Growth would be 20 basis points higher, while my Price to Sales and Price to Earnings would be a little lower. The third section shows the breakdown of the actual and model portfolios with regards to cash and sector. 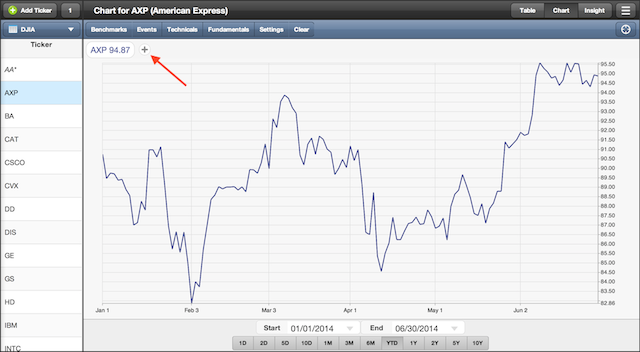 The benefit of a model like this is that you can plan future trades and see the impact on your portfolio. Not only can you see how the hypothetical trades change your cash position, but you can see things like how your sector balance and dividends change. You can even see changes in advanced risk metrics such as beta, volatility and the Sharpe ratio, and more. You can print or export your model if you want to work with it outside of Stock Rover. For Premium users, these models will automatically be saved. Next time you open the Modeling window, you’ll be able to see all you existing models, so you can build up a portfolio model over time, with research in between. Basic users can use the Modeling feature, but the models will not be saved. Keep in mind that portfolio trade plans are just trade plans—nothing you do in portfolio modeling will change your portfolios in Stock Rover, so we encourage you to play around with the feature and test different investing theories. For those of you who use Stock Rover in the classroom, you may find this feature to be particularly useful for demonstrating the implications of trades. This release also brings a beautiful (if we may say so ourselves) redesign of our tablet app, including more functionality, as well as more efficient use of the screen space. Let’s take a look. Instead of having the Chart, the Table, and the Insight panel all visible at once, like before, you now can choose which part of the Stock Rover app you want to see from the buttons in the top right (boxed in the screenshot above). The roomier layout allows the user to see more data without any clutter. We’ve also added the ability to modify your views via the wrench button in the top right (this is also where you can save the Table as a portfolio or a watchlist). That function was not previously available in our tablet app. The Research Box has changed form, but not function. It is now in the top left corner (boxed in the screenshot above)—tap it to enter in a symbol or company name. The number next to the ‘Add Ticker’ button indicates how many research tickers you currently have. 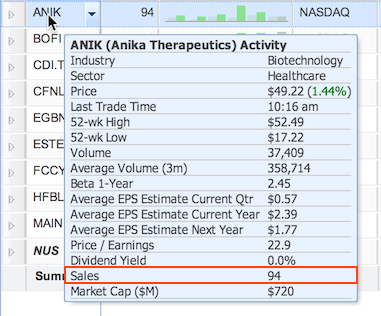 Click the number to view or delete research tickers. Long-pressing a ticker brings up the option of getting ticker info, charting, or adding the stock to a portfolio or a watchlist. Tapping an already selected ticker once will call up the ticker info box. The Navigation panel has been collapsed into a drop-down menu just underneath the research box—tap the selected item (in this example it’s the DJIA) to expand the Navigation below. If you load the Chart, you’ll see that the items in the Navigation panel stay loaded on the left, so you can easily add any displayed ticker with a long press. Or, by clicking the “+” icon in the legend pointed out below, you can type in any ticker symbol or name. The time period options are now permanently pinned to the bottom of the Chart. 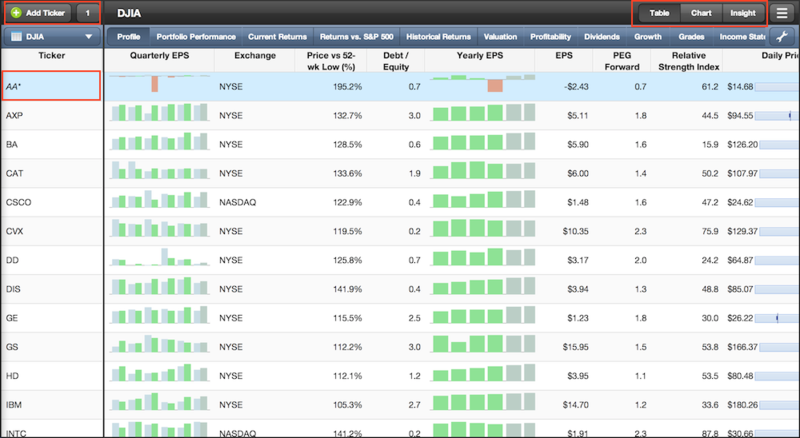 The Chart menus haven’t changed, you can still easily chart benchmarks, events, technicals, and more. To access the updated tablet app, users can simply login to Stock Rover from the browser on their tablet. The upgrade has also been submitted to the Apple Store and will also be available through that channel soon. We will be sure to let you know as soon the update is available from the Apple Store. Based on user feedback, the News tab in the Insight panel also got an upgrade. Now, all the news from the selected news sources will be aggregated into one feed, so you don’t have to switch between different sources to see all the news about a ticker. The news tab is split into two sections: one for stock-specific (or portfolio-specific) news, and one for market news. Expand or collapse the sections by clicking the +/- icons to the left of the news title. Below you can see that stock-specific news (boxed in image below) is collapsed above the expanded market news section. We’ve also added eight new custom metrics to the Library, available for download by our Premium users. Some of the metrics we’ve added are Annualized 10-year Return and the Price vs. 120-day Average, as well as a bunch of other price over 120-day metrics. For instructions on how to import these metrics, see ourhelp page. Yearly Sales Revenue (in millions) is now part of the ticker cell tooltip, so you can see it there right above Market Cap as long as you have ticker cell and/or chart legend tooltips enabled. There have been some small but helpful improvements to the Insight panel as well. First, in the Peers tab, the ticker that’s selected in the Table will automatically be selected in the Peers table as well, so you can easily spot it amongst its peer stocks. If a ticker is selected and the notes panel is visible, then the notes panel will automatically search for notes for only selected ticker, so you can quickly see if you’ve made a note about this stock before. To go back to all notes, just clear the search box. In the Detail tab’s Income Summary section, we’ve added Other Income Expense and Selling General and Administration as rows, so you can see those quarterly or yearly numbers for the selected stock. 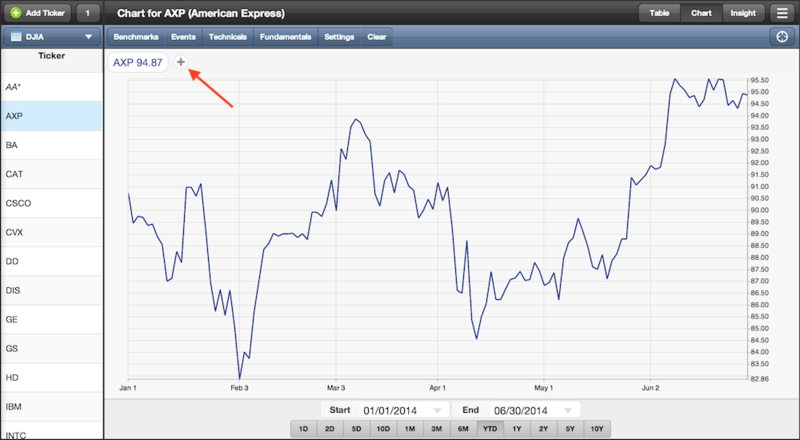 In the Chart, we’ve added information to the Portfolio Activity event. Previously, when selected this would show a triangle when a Charted portfolio had a trade. Now, when you mouseover that triangle, the tooltip will say the date and information about the trade. See the example below. 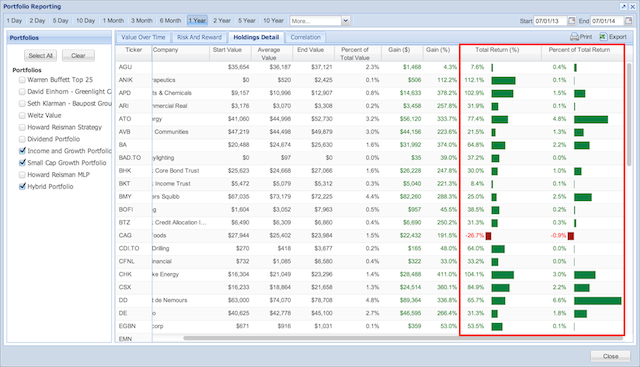 In Portfolio Reporting, we’ve added an Average Cash Value metric to the Value Over Time tab, so you can see the general cash position you held over the selected time period. 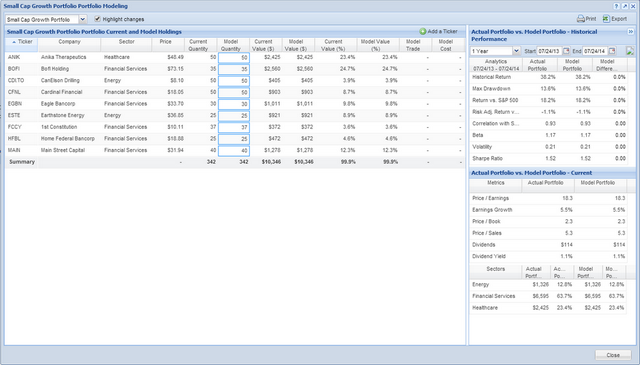 In the Correlation tab, we’ll automatically add the selected portfolio or watchlist as a whole to the matrix. So, if you have selected portfolio on the left, not only will its holdings load in the correlation table, but the portfolio itself will appear as a row and column as well. Previously, users had to add the portfolio manually. 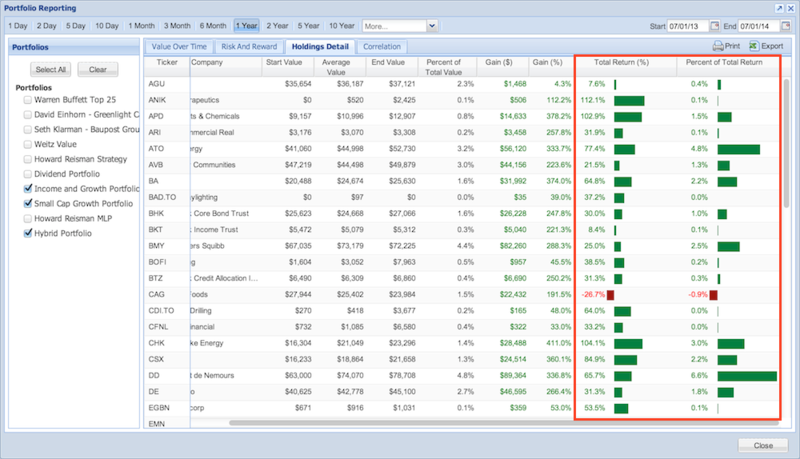 In the Holdings tab, the Total Return (%) and Percent of Total Return columns are now graphical, so they include a red or green bar representing their percentage values, shown below. For Basic users, we’ve changed the product so that you don’t always have to dismiss a pop up if you hit a premium feature, resulting in an uninterrupted work flow. This comes into play after the pop up has been seen four times. After that, if a Basic user clicks on a Premium feature, a message will appear in the lower right, but the user won’t have to exit out of this notice. We’ve also added the ability to include attachments when you contact us using the Feedback button. This means you can take a quick screenshot and send it along to help us better understand any problems or questions you have. After all, a picture is worth a thousand words! So that sums up what’s new in Stock Rover 4.4! We hope that you enjoy the new features, and appreciate the enhancements. As always, we’d love to hear from you, so send any questions, comments, or suggestions tofeedback@stockrover.com.